Two Chinese People’s Liberation Army Navy (PLAN) ships arrived at Naval Station Pearl Harbor, Hawaii on Tuesday, according to Chinese press reports. Guided missile destroyer Haikou (171) and hospital ship Peace Ark arrived at Pearl Harbor ahead of the Thursday kickoff of the Rim of the Pacific (RIMPAC) 2014 multi-nation exercise. The Chinese in total will send four ships for the world’s largest exercise — a first for the nation with an emerging blue water capability. The other two ships — frigate Yueyang (575) and oiler Qiandaohu (886) — are expected to arrive shortly. China will have a total of 1,100 personnel involved in RIMPAC 2014. Chinese will participate in range of training to include humanitarian and disaster relief (HADR) and gunnery exercises. It will be the first time the PLAN will participate in the exercise after the U.S. lifted a ban on Chinese participation in 2012. As part of the Obama administration’s so-called pivot or rebalance to the Pacific, the U.S. has softened stances on working with nations that have national stances that have prevented policy hurdles in the past. The U.S. has tried to establish closer military-to-military ties with the PLA with the U.S. Navy taking the lead. Naval leaders from both countries have visited each other. In July Chief of Naval Operations Adm. Jonathan Greenert and his wife will visit his Chinese counterpart, Adm. Wu Shengli. 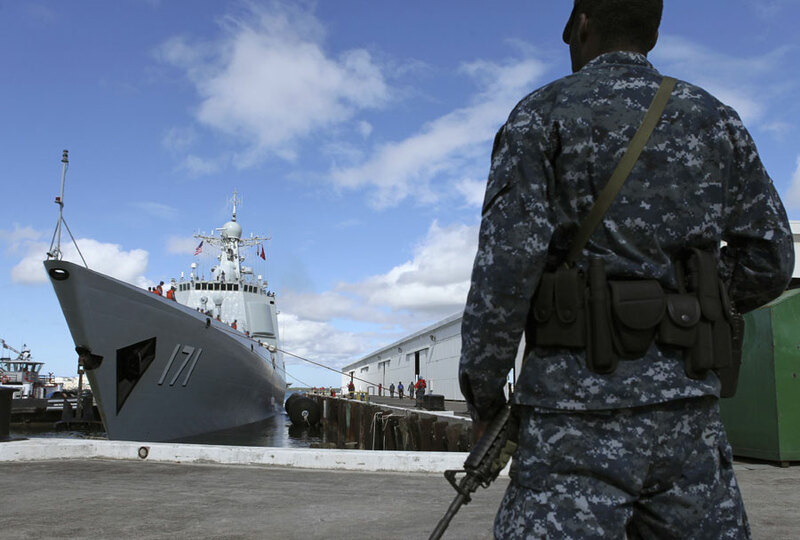 In addition to China, New Zealand is a full participant in the exercise for the first time since then Secretary of Defense Leon Panetta lifted a 1985 ban on New Zealand ships visiting U.S. naval installations. A Kiwi ban on visits from nuclear powered or nuclear-armed ships prompted the U.S. policy, which has improved since 2010. New Zealand participated in the 2012 exercise but their ships were denied access to Pearl Harbor and were moored at a civilian port. RIMPAC will include 50 ships, 200 aircraft and more than 25,000 military personnel from 23 nations. The exercises will run until August.